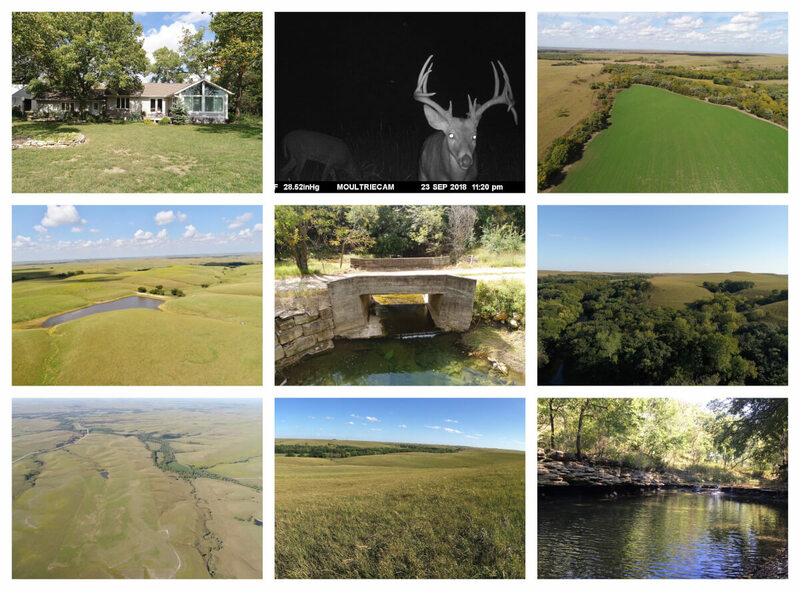 PROPERTY DESCRIPTION: 636.7+- acres in the Heart of the Scenic Flint Hills of Chase County Kansas. Rarely do you find such a diverse property for sale in this premium location. Features include rolling hills of native Flint Hills pasture, nearly 2 miles of Coyne Creek running through the center of the Ranch, a total of 6 different creek bottom tillable fields currently planted to Soybeans or Alfalfa, ponds, springs, and quality timber including Oak, Walnut, and Sycamore trees. This Ranch is set up for a nice balance of agriculture production and recreation. IMPROVEMENTS: The headquarters includes a Ranch style home built in 1950 with 1214 square foot of finished living area on the main floor. Features on the main floor include a bedroom, 2 bathrooms, kitchen, formal dining, living room w/ fireplace, and a spectacular sun room. Between the house and attached 2 car garage is nice large utility/mud room. The finished basement has a living area currently used as an office, 2 non-conforming bedrooms, a kitchenette, and a full bathroom. Other improvements include a 100’X 40’Quanset Building, 60’ x 40’ building w/ concrete floor, plus several other utility buildings and livestock shelters. The ranch has several sets of livestock working and holding pens. The set east of the house has automatic water. LEGAL DESCRIPTION: The East 1/2 of Section 1, Township 21 South; The West 1/2 of the Northeast 1/4 of Section 12, Township 21 South; The Southwest 1/4 and the West 1/2 of the Southeast 1/4 of Section 36, Township 20 South, ALL IN Range 6 East of the 6th P.M., Chase County, Kansas. LAND LOCATION: From US-50 HWY at the Clements exit, South on G Rd 3 Miles. 2017 REAL ESTATE TAXES: $5023.99. PROPERTY DESCRIPTION: 119+- acres total with approximately 59 acres currently planted to Alfalfa and the remaining 60 acres consisting of native Flint Hills pasture, Coyne Creek, and heavy timber. The northeast portion of the property is very secluded, with over 3 miles of big open Native Flint Hills pasture between this property and the closest public road in that direction. That offers an unusually large bedding area for Kansas Whitetail Bucks with the subject property being a prime neighboring feeding area. Multiple old rock walls and ancient improvements add character and history to the property. LEGAL DESCRIPTION: The East 1/2 of the Southwest 1/4 and all of the Southeast 1/4 laying West of County Road 336, in Section 26, Township 20, Range 6 East of the 6th P.M., Chase County, Kansas. LAND LOCATION: From US-50 HWY at the Clements exit, South on G Rd 1 1/2 Miles. 2017 REAL ESTATE TAXES: $1317.94. PROPERTY DESCRIPTION: 160+- acres consisting of approximately 74 acres of Brome grass, 33 acres of Alfalfa, and the balance in native pasture and timber. Water is provided by a small creek and a water well. Good property to utilize for hay production and winter livestock pasture. Don’t overlook the high quality hunting on this property! Past hunting tenants have been very successful on this property. LEGAL DESCRIPTION: The Northwest 1/4 of Section 20, Township 21, Range 7 East of the 6th P.M., Chase County, Kansas. LAND LOCATION: From US-50 HWY at the Clements exit, South on G Rd 6 Miles to 100th Rd, then East 2 Miles. 2017 REAL ESTATE TAXES: $868.87. TERMS: Earnest money is specified above and due at the conclusion of the Auction with the balance due upon Sellers submission of merchantable title and closing. Closing date shall be on or before December 17, 2018. Closing fee and title Insurance fee will be split 50/50 between Seller and Buyer. Selling subject to easements, restrictions, roadways and rights of way. This property is not selling subject to financing or inspections. Interested buyers need to view the property prior to the date of the auction and have financing available and any inspections performed prior to bidding. All pertinent information is available upon request. All announcements made the day of the auction take precedence over any other announcements or printed material.